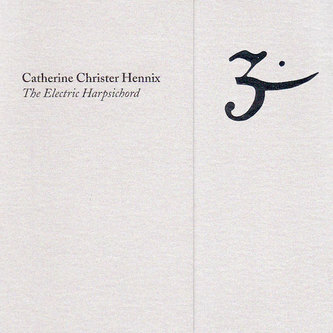 I’ve spent the last few weeks finishing a profile of Swedish mathematician/visual artist/composer Catherine Christer Hennix for The Wire, in honor of the recent release of her 35 year old sustained tone masterpiece The Electric Harpsichord. The conversation spiraled off in many ways, from mathematical logic to quantum field theory to the Swedish jazz scene in the 1960s – take a look, it’ll be in the October issue. It also got me thinking about drones some more, and why they can be such powerful audio experiences. My general hunch is that it has to do with sameness, which is a topic I became fascinated with in writing In Praise of Copying. Mostly we celebrate difference, diversity, novelty in our society. We associate sameness with fascist conformity, boredom, lack of imagination. In some ways of course, there is a sameness to things today that is disturbing: we value diversity but all diversity today has to be channeled through the marketplace, and with globalization, an increasing uniformity of places, cultures, societies. But maybe, as Alain Badiou says in his Ethics, the problem is finding the right kind of sameness. I note that Jacques Derrida, in his original essay on “Differance” actually wrote that “we provisionally give the name differance to this sameness which is not identical.” Somehow, that sameness dropped out of the picture as post-structuralism developed, and differance became mere difference. What did Derrida mean? Approaching this problem through Buddhist philosophy, I come to the notion of “nonduality” or, more clumsily but maybe more helpfully, “nonconceptual sameness”, meaning the nonexistence of concepts that allow for the elaboration of difference. I think what some people find irritating about drone musics is their sameness, nonconceptual or otherwise. But to me that irritation is a sign of resistance to what’s going on, because there’s always something new going on when you let yourself experience a drone fully. La Monte Young argued that “tuning is a function of time” and that as you tune into the harmonics in a drone, you experience new aspects of it. Your own relationship to that continuous sound changes because second by second you are changing, physically and cognitively. At the same time though, when you relax into the sound, it can be ecstatic, and that is where I would locate the “nonconceptual sameness”. You loosen up your own sense of yourself and something opens up. Somehow, the drone lets you concentrate … on what? The sound? On your own psyche experiencing the sound? Both probably. I think there’s a taste of the power of the drone in all copying, since a copy is a repetition, just as a drone is a repetition. That’s really what I meant by “in praise of copying”. The Electric Harpsichord is an uncanny piece. Henry Flynt wasn’t exaggerating when he called it “a revelation”. I’ve listened to it a number of times over the last decade and I invariably have the disconcerting but elating experience of the ground beneath me melting about half way through the piece. This is presumably what Hennix and Flynt meant when they coined the term HESE (“Hallucinogenic Ecstatic Sound Experience”) to describe works like EH in the late 1970s. When it was composed/performed, EH was part of a whole cluster of multidisciplinary efforts that Hennix was involved in ranging from visual art works to abstract Noh plays, to treatises on logic such as “17 Points on Intensional Logics for Intransitive Experiences, 1969-1979” and “Toposes and Adjoints”. Aside from a remarkable journal issue Io #41 published in 1989 (subtitle: “Being = Space x Action”) this work was never published. The Io issue is remarkable: it also features work by Hennix’s mathematical mentor Alexander Esenin-Volpin, a founder of the human rights movement in Russia as well as the mathematical school of ultra-intuitionism, a key essay by Flynt, work by poets George Quasha and Charles Stein, and a lucid introduction to Hennix’s work by Stein. As a non-specialist in the outer regions of advanced mathematics, it’s hard to evaluate how solid the mathematical work is, and how directly it can be related to the soundworks that Hennix was producing. 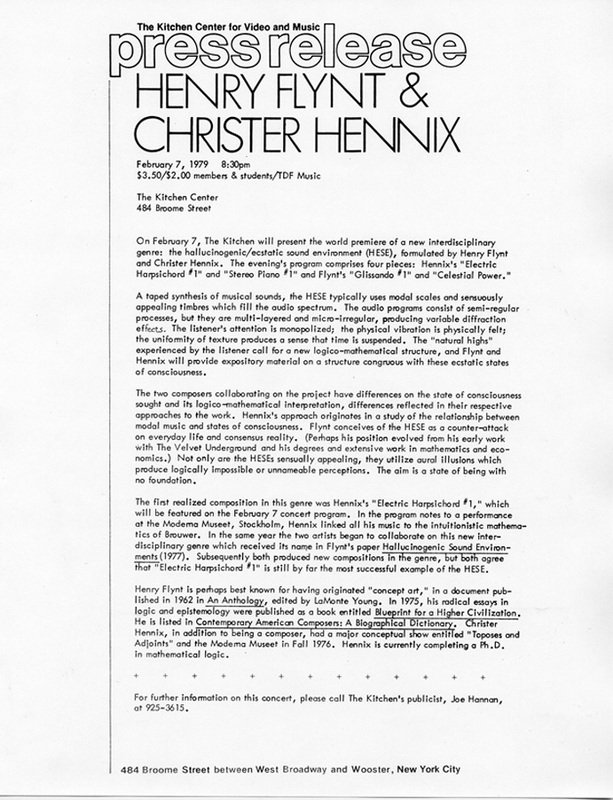 Yet the argument, made by both Hennix and Flynt, that one could extract a method for producing ecstatic sound works that is based on a radically reworked philosophy that takes in and appropriates mathematical logic, amongst other things, remains an intriguing one. Who even has that kind of ambition today? The notion that a radically different science or set of scientific goals could or would emerge from a different set of values to those that our own societies are built around today could be a very powerful one, taking us beyond techno-fetishism of both the libertarian and Marxist kinds on the one hand, and Luddite attitudes on the other. A lot is asked of those who want to take this path … but is that such a bad thing? Finally it comes down to the work, and, archivally, there’s not that much of it: EH was only performed once, though there are other unreleased recordings by Hennix from the 1970s. A number of Flynt’s HESE-related recordings, as is a duo recording with Hennix entitled “Dharma Warriors”. On the other hand, Hennix is alive and well and living in Berlin, where she now has a band called the Chorasan Time-Court Mirage, featuring the marvellous Italian born dhrupad vocalist Amelia Cuni. A demo recording that I’ve listened to is pretty mesmerizing: a digitally produced drone, with Hilary Jeffery’s trombone and Hennix’s voice. It’s trance inducing but not New Age at all! Definitely a work in progress …. Is There Music After 091101? No doubt, it’s premature to talk of forgiveness right now. 091101 was an unspeakable event – as I write, the bodies of those trapped in those planes and the WTC towers remain unburied, just a few miles away from me. Silence is not a word that comes to mind when one speaks of New York City – but at least for the first few days after the event, the city was almost silent. Nothing however draws pundits and speech as much as the very impossibility of speaking. And music also steps into this void of the unspeakable. But not unambiguously, as the above example in which Jankélévitch assumes that he has the power to forgive or not, suggests. One might also think of Nation of Islam leader Louis Farrakhan’s playing of a Mendelsohn violin piece, to show his “respect” for the Jewish people he has “insulted”. Or the kitsch of Paul McCartney’s “Ebony and Ivory”, Michael Jackson’s “Black and White.” Can music act as the true expression of a forgiveness that must go beyond words – or is it a substitution for it, a convenient sleight of hand? One of my teachers, Avital Ronell, began her first post 091101 class by ringing a bell. Another began by invoking the memory of a street musician heard on the way to school that day, belting out a tune on an old organ. At the strange shrines that sprang up spontaneously all over lower Manhattan in the days after 091101, there were the predictable post-Lennon folk singers, but also samba groups, Tibetan chants, jazz. For myself, most of my records and CDs sit in the exact same place they were on the night of 091001. One symptom of trauma is a visceral distaste for everything that one was doing at the moment of shock. I’m sensitive to sounds, although, since I watched 091101 from my roof in Williamsburg, far enough away to see events unfold without hearing the sound, perhaps my ears are in better shape than my eyes. When I see an aircraft, I have doubts as to what it is that I am seeing: a vehicle or a bomb. For the first weeks after 091101, the only music I was able to listen to was Indian ragas, which, with their sustained focus on a particular emotional mood, slowly penetrate consciousness until everything else falls away. And I thought about raga master Pandit Pran Nath, born a Hindu in what is now Pakistan, member of a Muslim gharana in India – precisely the kind of liminal figure we need right now, able to move between and reconcile worlds that are tragically polarized, through devotion to perfect sound. To my surprise though, in the last week or so, I’ve found myself listening repeatedly to the queasy cold-war music of my youth: Bowie’s Low, early Pere Ubu, This Heat – avant-rock from the late-1970s that was both parasitic on, and sought to transform the prevailing culture of political polarization. Music that worked with fear, that looked for lines of flight. Does it sound gripping right now because of this, or is it that I’m going through a protective movement of regression, to “simpler” times?